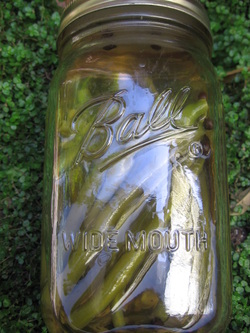 Place vegetables in a quart canning jar. Bring all other ingredients to a simmer (except chili pepper if using). Stir and pour over vegetables in Mason jar. Add chili if using and let sit at room temperature until cool. Screw on lid once veggies are cool and refrigerate overnight. Notes: Can use radishes, carrots, turnips, beans or combo. Makes 1 qt.